160 iS/7 7 Piece Kraftform Plus 100 Series VDE Slimline Set is equipped with insulated VDE blade tested individually to 10,000 volts, in accordance with IEC 60900. This ten times higher testing load guarantees safe working at their mximum permitted load of 1,000 volts. Kraftform Plus handle for pleasant, ergonomic working that makes blisters and calluses a thing of the past. Hard gripping zones for high working speeds whereas soft zones ensure high torque transfer. 'Take It Easy' tool finder, colour-coded according to profile and size for easy identification. 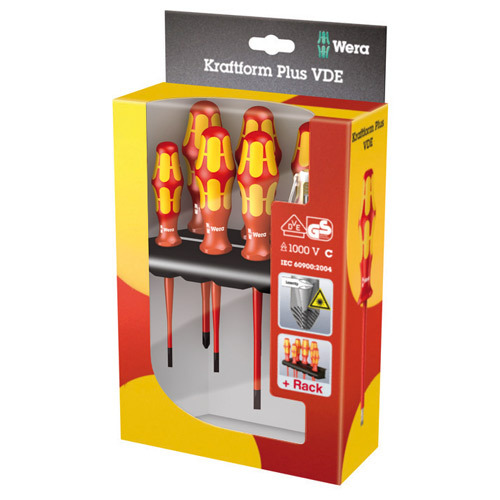 All Kraftform screwdriver handles have a non-roll feature at the lower end, the hexagonal design prevents any annoying rolling away. Impact strength tested at -40°C guaranteeing safety even under extreme conditions. Reduced blade diameter. with integrated protective insulation, allowing low-lying sunken screws and spring elements to be accessed and actuated.